Arachnophilia is © Copyright 2018, P. Lutus. All rights reserved. Installation / Troubleshooting | The Most Common Question about Arachnophilia | Why is Arachnophilia now a Java program? I have requested [ ... ].com to make you a donation [...] and they asked if you have a donation page. I have used Arachnophilia for many years and you richly deserve reward and recognition for this excellent product. Thank you! If you are willing to accept a donation please let me know how the donation can be made. I am touched by your offer — thank you — but in truth, I don't need the money. Here's what I suggest — choose a deserving software project that really needs donations to move forward, and make a contribution there. In this way you will be supporting free, open-source software as a social principle, and all will benefit — including me. Thanks again, and also thanks for undercutting the common perception that free programs can't have more value than their price. Read "A note about Freeware"
For Windows users more comfortable with automatic installation programs, download the Windows executable installation program Arachnophilia.exe (2.6 MB) containing the Arachnophilia executable Java JAR file. For all others, download the executable Java JAR file Arachnophilia.jar (2.5 MB). Because Arachnophilia is licensed under the GPL, the source code is available. Click here to download a complete Netbeans project archive (1.5 MB). Acquire and install the latest Java runtime engine. Click this link to download the most recent Java runtime engine, required to run Arachnophilia. At the time of writing, the latest Java runtime engine is available for all major platforms — always upgrade to the most recent Java runtime engine. Windows users may not want to select this runtime engine to handle applets in MSIE (this choice is offered during installation). Sometimes this reduces Java applet performance on smaller, older machines. Run the install executable you downloaded (Arachnophilia.exe), follow the instructions, be sure you have also installed the most recent Java runtime before running Arachnophilia. Put the JAR file you downloaded (Arachnophilia.jar) anywhere appropriate on your system, be sure you have also installed the most recent Java runtime before running Arachnophilia. In most cases you will want to delete the Arachnophilia user directory located at (user home directory)/.Arachnophilia, after saving any custom macros you may have created. This step assures that you have the latest macro and menu configuration and the most recent documentation set installed locally. Click the program icon located at "Start ... Programs ... Arachnophilia ... Arachnophilia"
This icon can be copied onto the desktop or anywhere else you want. Open a command console (Linux: shell console), move to the Arachnophilia program directory, type "java -jar Arachnophilia.jar"
For convenience, this command can be made part of a shell script, and those using X windows can easily make a desktop icon. Complete all the steps in the list above. One more thing. Did I remember to mention that you have to complete all the steps in the list above? Delete the Arachnophilia user configuration directory located at (user home directory)/.Arachnophilia, then run Arachnophilia again. Go to the directory containing Arachnophilia.jar. Run a checksum program (either md5sum or sha256sum) like this: "md5sum Arachnophilia.jar". Note the result, compare it with the values linked above. If this test fails, download Arachnophilia again, and only from this site. If you are reinstalling Arachnophilia, in most cases you should delete the user configuration directory located at (user home directory)/.Arachnophilia. This assures that any updates to the menus, macro system and documentation will be reflected in your copy. The Java developers have recently created a very nice look & feel (appearance/behavior package) called "Nimbus" — it's the enabled look & feel in the above graphic image. To select this look & feel for your copy, go to menu item "Tools ... Set Look & Feel" and choose "Nimbus" (it's available on most platforms). It represents a big improvement in appearance compared to the old default. Each user who logs onto your system (or network) will get a separate installation of the Arachnophilia configuration files. This means each user's configuration choices and custom macro set are distinct and separate. Read the Online Arachnophilia Documentation. Read the Arachnophilia Frequently Asked Questions. By far the most common question about Arachnophilia, one I answer with great regularity, is "Does Arachnophilia work with ..." (name an operating system). Here is the answer. 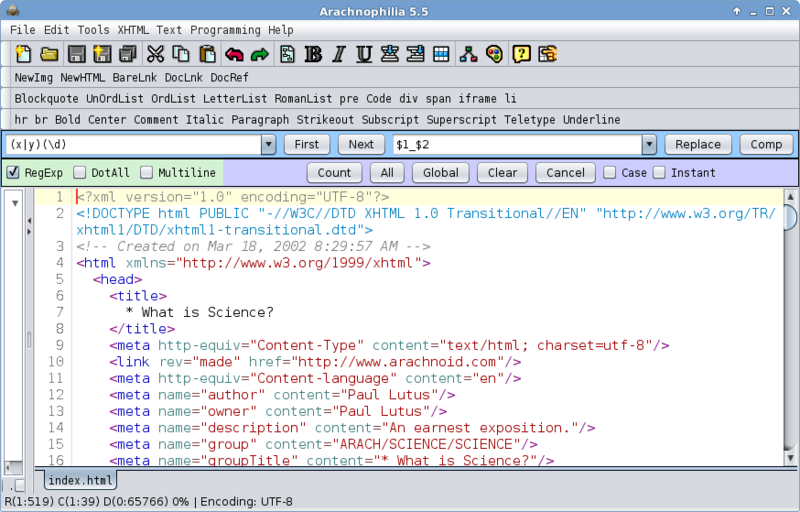 Arachnophilia is written in the Java computer language. Java is available for nearly every operating system in existence, and certainly for all operating systems in common use. Therefore yes, unless you just personally wrote a new operating system over the weekend, Arachnophilia works with it. The second most common question is "Why don't I see a bug fix or new feature described in the Revision History after I have downloaded the latest version?" The answer is that you need to delete the Arachnophilia user directory located at (user home directory)/.Arachnophilia (after saving any custom macros you may have written). This step triggers a fresh installation of the documentation and macro / menu system for the current release. For answers to other common questions, please read the FAQ. Why is Arachnophilia now a Java program? Virtually from the day I released the earlier version of Arachnophilia, people on non-Windows systems have been asking for a version for their machines. This new release addresses that need — it will run on virtually any computer. Until recently I wrote programs only for Windows, but like many, I have noticed that Microsoft's originally positive behavior and attitude toward its customers has gradually evaporated, replaced by an increasingly fascist policy — greater profit, less time wasted improving its products. Over time, Microsoft's programs have gotten worse — more and more features, less and less internal coherence. But this all pales compared to an apparent Microsoft corporate goal: complete control of the end user's computer. It has recently been discovered that Windows XP users may have parts of their operating system replaced by Microsoft while they are on line, without any overt notification or permission. This change of policy is official — it is in very small print, but Microsoft is not trying to conceal their plans. Things are so bad at Microsoft that someone like me can write and give away a program that does things no Microsoft program can do, at any price. This is not a claim that Arachnophilia is a fantastic program, it is more a statement that Microsoft's programs are rapidly drifting toward dreadful. Look at it this way. When you download Arachnophilia, I don't require you to call me up to "activate" my software. I won't sell your name to my "corporate enterprise partners," in fact chances are I will never find out your name. Arachnophilia won't die suddenly because you didn't call me up within 50 days of the installation, it won't surreptitiously connect you to my corporate office so I can spy on your computer, it doesn't die if you try to install it on more than one machine or give it to a friend. And — hard to believe — all these dreadful things are true of current Microsoft products. And possibly more important, Arachnophilia learns things from you — you tell Arachnophilia how to behave. If you don't like how a toolbar button acts, simply right-click it and edit its contents. There is no Microsoft program at any price that can do this. Read more about Microsoft's recent behaviors on my Boycott Microsoft page. Computer programs written for one platform are doomed to an early obsolescence. This is a truth about computer programs that is only now being addressed by languages like Java. In modern computer technology, there is a rapid trend toward computer hardware costing less and less, and computer software costing more and more. This means portable, reusable code is increasingly important. I have spent most of my programming career writing programs that lasted, say, five years, after which (obsolescence issues aside) there might not be a machine that could run them any more. Arachnophilia FAQ. Hints for problem-solving. Always look here for new suggestions — the online version of the FAQ may be more recent than the one bundled with your copy of Arachnophilia. A blow-by-blow history of the changes in Arachnophilia. Look for the file (user home directory)/.Arachnophilia/ArachErrorLog.txt. If it has any contents below the dashed line, include the entire contents in your bug report (especially the first line). If there are no errors reported, be sure to say this also. Go to http://www.arachnoid.com/arachnophilia/arach_email.html to submit your report. This page is not for inquiries about making an HTML table look a certain way. It is only for Arachnophilia bug reports.